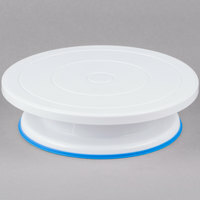 A cake decorating stand is the perfect option for bakers to use to make the icing process simpler. 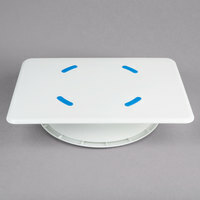 By elevating the cake or pie up off the tabletop, it’s easier to access every part of the cake. 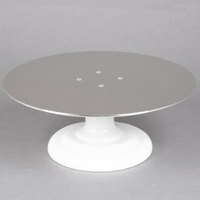 We also have cake stands that revolve, making the decorating process even more convenient. 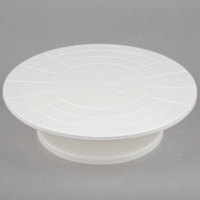 You can also use your cake decorating stand for enhancing the visual appeal of your finished creation. 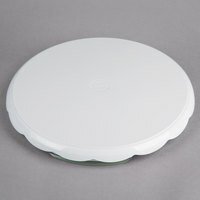 Display cakes in bakery display cases, and the added effect of the stands can help increase impulse sales. 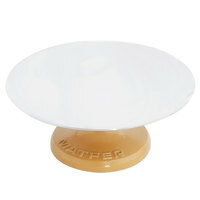 Also make sure to check out other great items from Ateco, Matfer Bourgeat and Wilton. 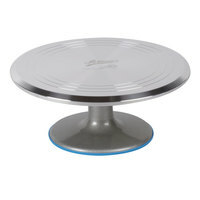 Whether you’re operating a bakery, supermarket, or café, revolving cake stands will help you with all your decorating needs. 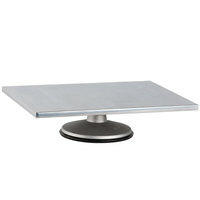 If you’re looking for a stationary cake stand or a lazy Susan style, we have an option for you. You might also find our selection of baking spatulas and decorating combs helpful to create a smooth layer of icing. And, after you make the sale, package your cakes up in our cake boxes and bakery boxes. 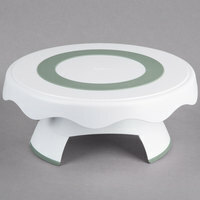 If you're wondering where to buy cake turntables, we have a large selection of cake turntables for sale at the lowest prices.